Maysaloon - ميسلون: Turkey and secularism (Just don't mention genocide). Turkey and secularism (Just don't mention genocide). 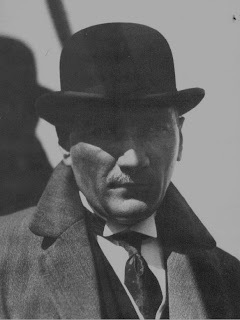 One of the ugliest examples of secularism in the Middle East is Turkey, the result of Ataturks' (pictured above with a ridiculous hat) grotesque ideology and obsession with emulating the West. I just hate how some people idolise the man after what he did and it's with some glee that I watch Turkey awaken it's Islamic identity. Nothing has been more humiliating for the Turks than holding their begging bowl at the doors of Europe for so long and then watching a country like Romania whizz past them. Now tell me, if the 'Ottoman' was responsible for the Armenian genocide why are Turkey's 'secularists' (read Young Turks and military establishment) so fanatical about erasing it's memory? In fact, weren't all the genocides of the twentieth century perpetrated by secular governments? "In fact, weren't all the genocides of the twentieth century perpetrated by secular governments?" Is that really your grand argument Wassim? Notwithstanding, that I agree that turkey's "secularism" is a true form of dictatorship, but regardless... I ask again, is that your argument against Secularism? The ottomans were not secular, the matter of fact, there were genocides long before secularism, nor Muslims nor Christians were innocent of them. I have a feeling that you firmly "believe" that Islam has higher moral grounds than any other ideology or religion [theoretically and historically], and it's intriguing to me, What interpretation of Islam is that? What is that super-dooper solution that will make all troubles disappear? because, not only do u preach Islam as the way, you preach Islam as the Only way. I've never actually preached Islam, I've only ever replied to false claims about it or for it. In fact, I've never advocated any political system as that can quickly devolve into intellectual cheerleading. As for secularism, I think I can come up with a better argument than that, and I have done so in an earlier post actually. I'll e-mail you the link to it. Genocide is not part of my argument, though I bring it up because only secular governments have perpetrated genocides and we both know that. In a region where the consensus dogma is towards separating religion from state, it begs the question. What do we call the current state system if not that? From Morrocco to Iraq up till 2003 all the countries have been even more fiercely secular than European or American countries. Is the Saudi travesty the only example we can conceive of when we refer to non-secular forms of political organisation? That's an open question I leave to you. Wassim, the ottomans were not secular, and they perpetrated massive massacres against Kurds and Armenians. I am not saying they did it because they were "not" secular. But in the same sense, the massacres of the French in Algeria, were not because they were "Secular". Where the hell do you find secularism in the Arab world? How was Iraq secular? How was Lebanon ever secular... let's go closer to our own backyard, Syria, which was the "closest" you can get to secularism in the arab world. Syria is still a place where the president still HAS to be Muslim, Syrian constitution clearly declares that the constitution takes after Shariaa when it comes to its civil laws. And/or in practice, the 80s and 90s were not just the furthest thing from Secularism, they were an era plagued with sectarian politics. No, my friend, there was no secularist regimes here, they all claimed to be, but Saddam was no secular, you know that very well. And no, It is not Saudi arabia the only example that runs through my head, but, I can't for the life of me, seem to remember reading about an Islamic [or any other religion] vision for a state that promises equal rights to all its citizens regardless of their belief system [or lackthereof], not even in theory. My main point is, It is an inherent quality in religions to be exclusive. And thus, you can hardly build an inclusive state on such principles. Yazan, I think you're confusing massacre with genocide. A massacre is different from genocide and I think we should make a note of that distinction when and where we use that term. I think we are talking past each other because of our defintion of secularism. You seem to imply that secularism promises equal rights to all citizens but as you said earlier, Turkey is quite clearly not a just country for all it's citizens. In fact, even your argument about religous states as non-inclusive is not valid. The 'state' in and of itself is also exclusive and is a violent (physically and non-physically) entity built on the exclusion of others. So you're saying the words 'state' and 'inclusive' in the same sentence is not really valid and only increases my confusion after you say an inherent quality of religions is to be exclusive. I fear we don't share the same view on what religions are either as well as on what secularism is. Let's even go further with another question. What is democracy if not a tyranny of the majority and the rule of the mob? What do you do when a secular minority 'force' a religious majority to be free? I'm not advocating Islamic rule, but I'm trying to make you see the flip side to your argument. Although the massacre/ genocide of the Armenians happened before Ataturk took over, I don't think it's fair to blame Ottomanism. The Ottoman area, from Yugoslavia to Iraq, degenerated into a mess of ethnic and sectarian hatreds which we still haven't recovered from AS OTTOMANISM COLLAPSED. European secular nationalism spread empires around the world and the Ottoman empire lost confidence and desperately tried to keep up by ditching its religious ideology and becoming nationalist. In the last days of the Ottomans the Empire saw itself as Turkish (and the Turks saw Kurds, Arabs and Armenians as inferior races). Traditional Ottomanism was far better able than modern nation states to allow various religious and ethnic communities to coexist. So I'm with Wassim here. However, most contemporary forms of Islamism are intolerant and have been thoroughly penetrated by nation-state obsession. It's a sad world. In my opinion, we need more socialism and politics based on 'rights' - but a socialism which isn't this time a form of sheer materialism. Wassim - wainak? Please respond to my message! You said yourself that "only secular governments have perpetrated genocides and we both know that." I don't see how that holds true. Again, The ottomans were not secular, and they committed acts of genocide against the Armenians and Assyrians [since the kurdish massacres are not considered genocide]. The fact is, the term genocide is a very recent term, it is vaguely defined. So I don't see how exactly, ONLY secular governments committed genocides. * (e) Forcibly transferring children of the group to another group. What's the Islamists' position on the genocide, and I guess minorities in general? That's a very good question Nadia, I don't honestly know but it would be hypocritical of them not to have even an unofficial objection to injustice. Sorry I forgot to reply to your last comment. The question you've posed to me isn't one I've set out to answer in post anyway. I'm not saying that any of those countries you mention are shining examples of non-secular governments. In fact, those governments guarantee peoples rights not because they have chosen to be secular, but, I suspect, for other reasons completely. If I understand you correctly, I think your main fear of non-secular forms of government is that the rights of minorities would be in danger. However, we both know that there are plenty of secular governments in the world which discriminate against minorities both in the present and the past. Turkey, Italy, Spain, France, China. A variety of levels of freedom yet the same problem it would seem. So, theoretically, it could be possible for a country with a non-secular government to also have similar levels of freedoms, yet rather than a materialist capitalist paradigm informing it's laws and policies, it can still be, using your example, Islamic. Now the question is, why do we view Islamic conceptions of law, justice and government as so alien, so frightening, when they are clearly a part of us and our own political and social context? At the same time, we consider albeit admirable European ideas of 'enlightenment' as "universal" and devour them greedily whilst our very own values are discarded without so much as the benefit of the doubt. All I'm asking for is some imagination, using a different starting point for our questions to solve our problems. Correct me if I'm wrong, but you seem to be treating secularism as a single ideology rather than merely a means of governance. Secularism is merely the separation of the religious institutions within society from the political ones. This does not mean, however, that the mere act of separating religion from state gives you a single system of governance, or solves all problems facing states and their particular political systems. However, I strongly believe that secularizing the state is a necessary requisite in building an advanced political entity guaranteeing the rights and freedoms of it citizens. "... and then watching a country like Romania whizz past them." Please don't insult Romania. I know it has a bad reputation, but only part of that is accurate. Peace.